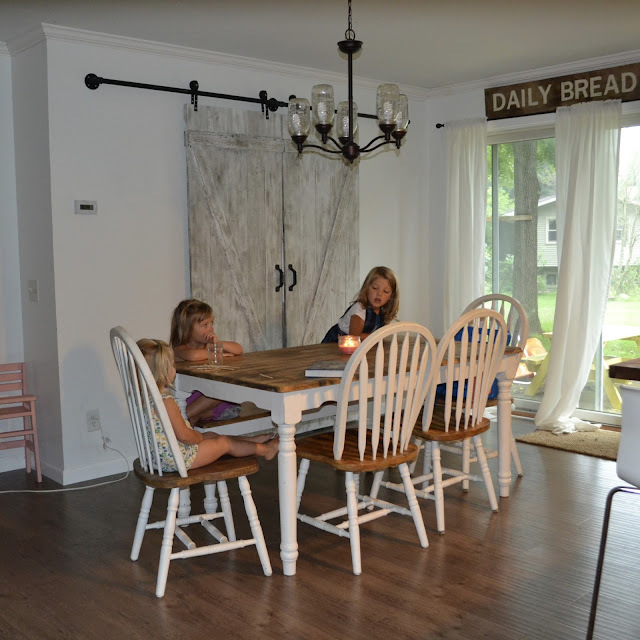 Last week, we started our first official year of homeschool. 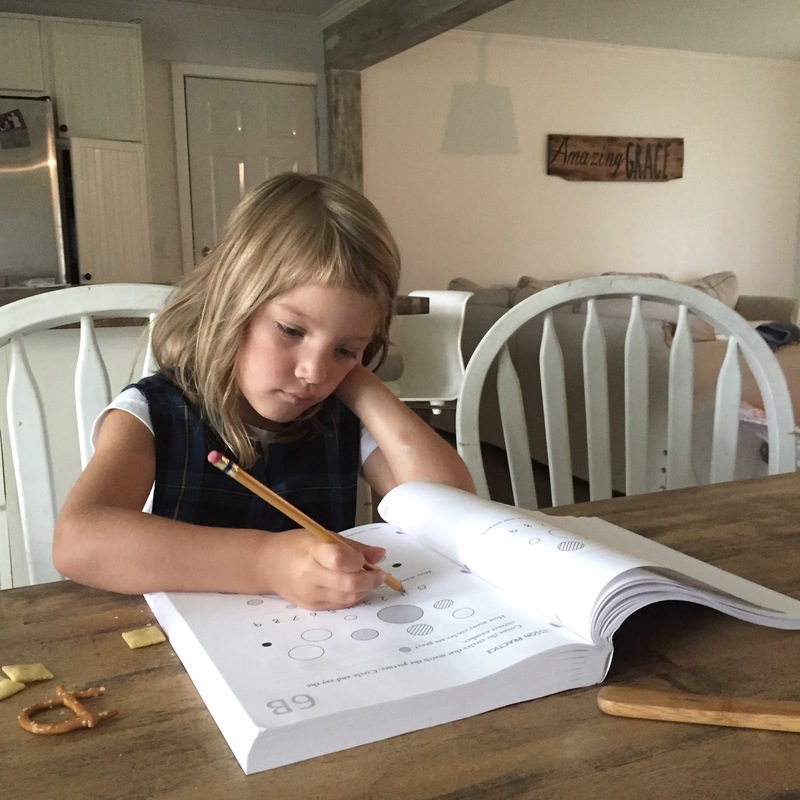 Last year, when Sophie was a preschooler, we did some homeschool work, including teaching her how to read. And of course, in many ways, I have been homeschooling Sophie for the last five years. But this year, she is a kindergartner! So we are officially doing this thing called homeschool. I am beyond excited about it (most days), and she is as well! I've written before about it, but I am using a homeschool method called Charlotte Mason. If you're interested in knowing more about it, you can read my blog post about it here, but the very best way that I can explain this method in a nutshell is to say that it is a relaxed rigorous approach. I know. That's basically a complete oxymoron. But, it expects a lot out of the child while also recognizing that a child is a person and an individual who needs to play and who learns best when he or she is understood and cared well for. After getting dressed, making our beds, eating, cleaning up, nursing the little babe, and taking care of the 20 mishaps and interruptions that can happen in a morning, we begin our day at the kitchen table. I have no set times, but the hope is to begin this around 9am. At the table, we do our Bible time. We begin with prayer. We wrote prayer requests on popsicle sticks, so we each choose one of those and pray for that, but we also have a family member of the day to pray for (i.e. We pray for Brielle on Wednesdays). After praying, we read from Catherine Vos's The Child's Story Bible. 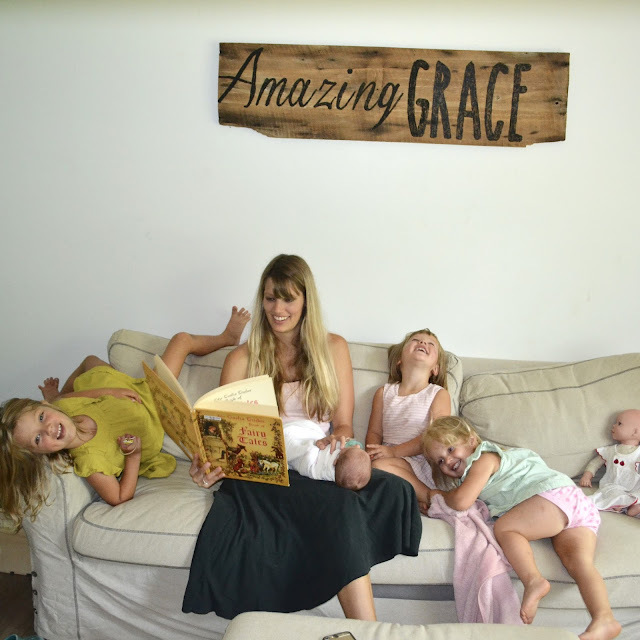 I love this children's Bible and highly recommend it. When we finish reading a chapter, we then say our verse together. We are working on Psalm 23 this month, and Sophie also has a verse each week that she learns for her Wednesday night church class. I want this time to feel sacred and important (I'm not sure if anything can feel sacred with a two year old who is loud and potty training, but we're trying)... so we light a candle during this time, and I expect them to stay in their seats and listen. For Spanish, we aren't using a book this year. I am just teaching basic greetings and will use TPR (total physical response) to teach objects and actions. I am using Ambleside Online for our hymn and folksong schedule. When we finish with this time, I then work on the three Rs with Sophie (reading, writing, arithmetic). The other girls don't have to be present during this time, but they pretty much always are. For reading, I am working on building Sophie's confidence as well as her word recognition. Last year, we went through Teach Your Child to Read in 100 Easy Lessons. It was good, and Sophie learned a lot, but she isn't reading easily and with confidence still, so that's my aim for this year. One of my plans is to help her recognize more sight words. I have quite a few games planned to help her with this that include fine motor skills and large motor skills (jumping up steps, hop scotch, leaping little toy frogs). We will also use readers to give her practice in reading. After reading, we move into our math work. I am using Math U See, and Sophie has loved it! She has even been asking to do extra lessons (which I gladly agree to). We also plan to do nature study. This will include reading books about nature, taking walks, playing outside, doing nature crafts, and finding new and interesting plants and animals and bugs outside. This is a journey that the Lord called me to a year ago, and my prayer is that I will continue to let him guide me on it. 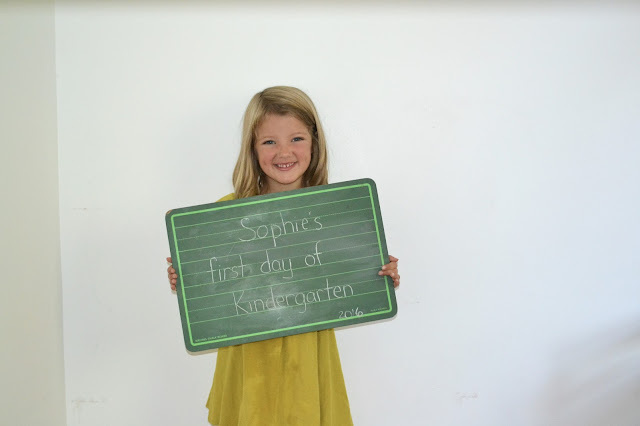 I know that I will grow and learn this year just as much as Sophie does! My husband and myself have spent time at the Phoenix preschool, while class was in session, and more than approve of the way they handle the children. My son comes home singing songs, is easier to direct at home, (i.e. cleans up his toys without fuss, etc.,.) and is always asking when he may go back to school.